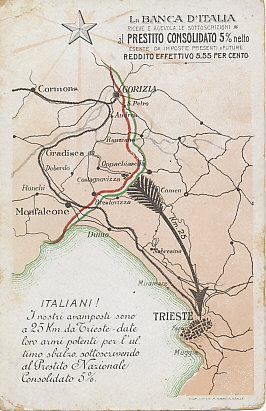 A call to Italians to buy war bonds to help fund the powerful weapons needed for the last push to Trieste, a mere 25 kilometers from the Italian front lines. It pays 5%, after all, tax free, for an effective rate of 5.55%! I nostri avamposti sono a 25 Km da Trieste — date loro armi potenti per l'ultimo sbalzo, sottoscrivendo al Prestito Nazionale Consolidato 5%. 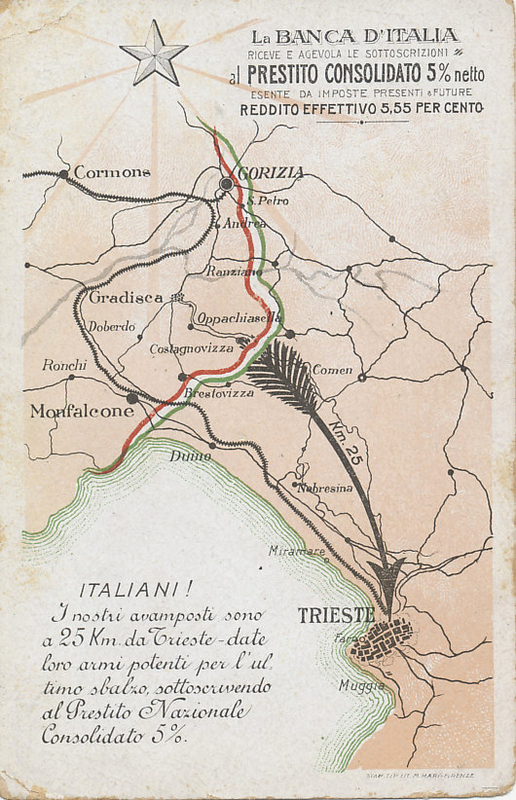 Our outposts are 25 Km from Trieste - give them powerful weapons for the last rush, by subscribing to the National 5% Loan Consolidation. The Italian Front is a battle front in Europe.